I meant to do this many many months ago, but where does time go? Anyone else with me? Since having kids, life has become quite busy. I used to think life would be so easy and simple if I were a stay at home mom. So much time to do whatever I wanted to do during the day, go places, get projects done. YEAH RIGHT! 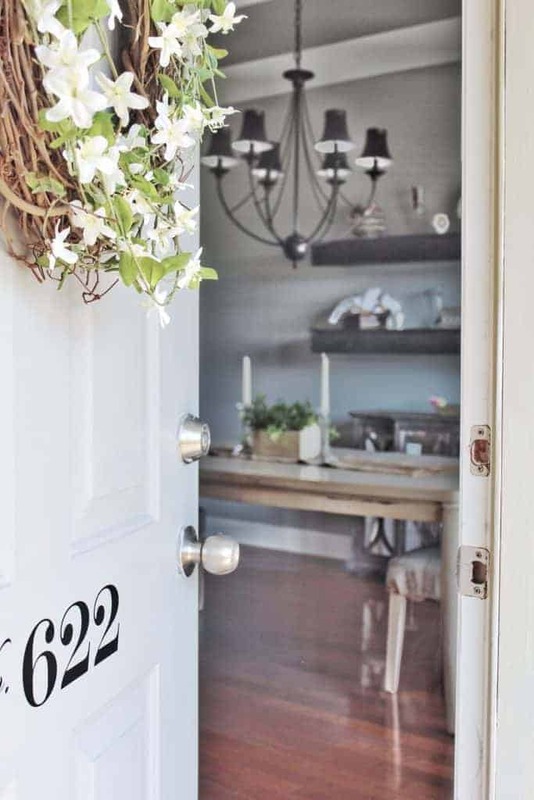 All that to say, sometimes it takes a while to get anything done around here, like creating a MODERN FARMHOUSE FRONT DOOR DECOR. My front porch and front door decor was not in terrible condition, but not the modern farmhouse style I wanted. Lets just say I wanted to put my own “touch” on it. I had seen all these cute pictures on Pinterest of front porches with “FARMHOUSE STYLE” wreaths and number decals. I had to have that same style!! 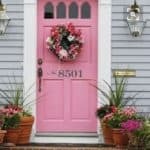 Here are a few pictures from Pinterest that inspired my new FRONT DOOR DECOR. 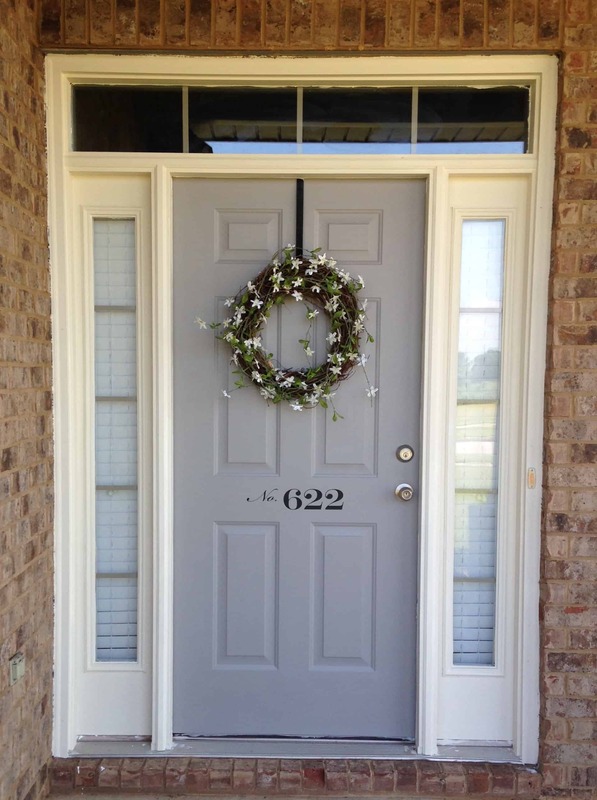 I love the simplicity of a pretty pale color, a simple DIY wreath and number decals. I think it makes it look so welcoming! Like I said before, not bad, but a lot of brown (this was a theme in my home when we bought it). I knew I wanted to repaint the front door and I love all the pictures I had seen on Pinterest of doors painted in the color blue. So here I go painting…. I started by painting the door blue, but it just didn’t match the home or the style I was going for with my new FRONT DOOR DECOR. After a few more tries with a few other paint colors (gray, brown) I eventually settled on a mix of a grey and a brown. Yes, I mixed paint colors. FYI if you ever do this, just make sure to save enough for touch ups, because you will never be able to mix the same color again. Next I painted the columns. They were a darker tan, more like a brown, so I painted them a creme color to brighten it up. I ordered some decals from an etsy shop called “Leen the Graphics Queen” with our front door numbers. After applying the numbers and adding a simple DIY wreath, I’m super pleased with the front door now! I’m happy to say I’ve created a new look with my modern farmhouse front door update. The wreath was a simple $4.99 grapevine wreath from Hobby Lobby with a garland of flowers that I hot glued around the wreath. With a coupon for 50% off the garland, the total wreath cost was $15. Doesn’t this door just say, “Welcome, glad your here!” LOL, I don’t know about that, but I’m pleased and I feel like I accomplished the look I was going for with my new FRONT DOOR DECOR. What do you guys think about my new Modern Farmhouse FRONT DOOR DECOR? I thin that color is gorgeous. It flows with the brick color but also holds it’s own. It looks great! Thanks so much for joining the DI & DI Link Party, hope you had as much fun as we did having you. 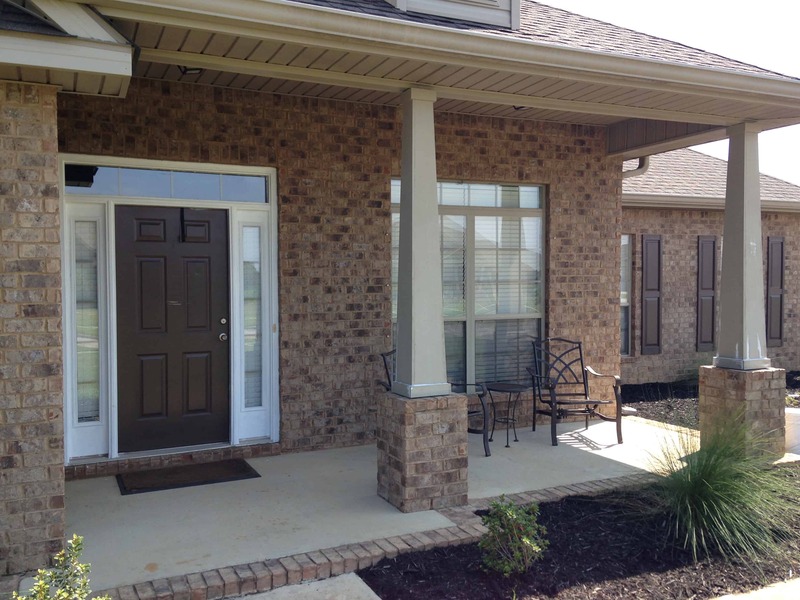 I think that front door color is perfect! Love the new address numbers and wreath too. I think it IS happy and says come on in! Great job. The door looks so much better! You really did a great job lightening it up. Have to wonder about all that brown that builders were using around 2010. I loved it then, but now it is too dated. I have a suggestion for you: paint a couple of layers of the paint you mixed up on a stir stick, write the info on the back of it and which room you used it in, and put a hole on one end and put it on a key ring or chain. Then if you need more of it, take it to Home Depot so they can use their computer to color match it. I’ve had great success with HD’s color matching. And, when you sell the house it’s a great thing to leave the new owners. I’m your newest follower. wow great idea! Thank you so much. I’m so glad you enjoyed my post. Have a wonderful week. Beautiful home, front porch, front door and wreath. Like that you kept wreath simple, not too much décor on it. 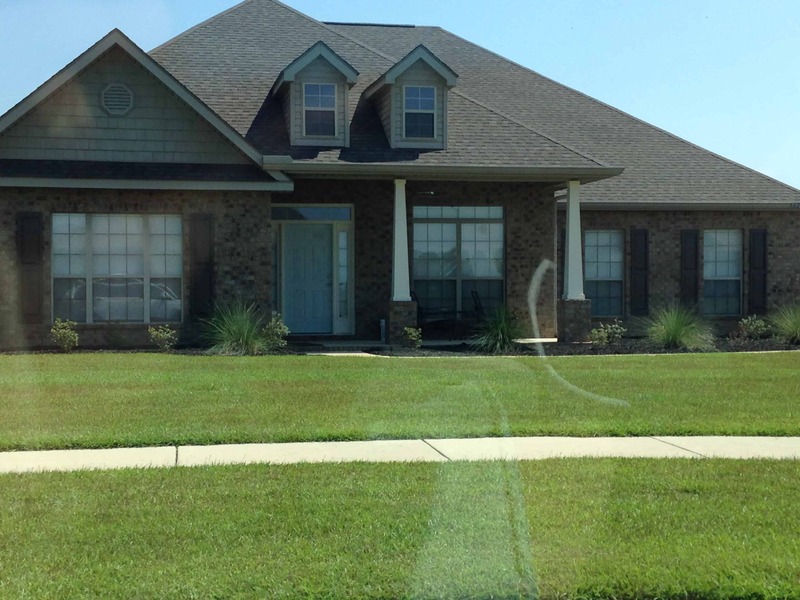 Painting columns helped also, made difference in how light front of house looks. Love the #’s on middle of door, nice adornment for door. Looking at your wreath I realized I have some garland similar to yours so just need to hunt up grapevine wreath and go with it. Our front door is white but I would love to paint it forest green to go with exterior trim. Hubs not onboard with all the great ideas I see on blog land so have to slowly change his mind and get him to buy the paint. Want to get him to make some simple shutters for windows also. Glad you like my front door update. Maybe your hubby will be on board soon. Have a great day! Your door looks awesome. Simple but makes a great statement. Three years ago I painted my front door a pretty blue called A Breath of Fresh air. I love it. Its getting worn out now though and I am redoing the back deck so I am painting it a new blue/teal colour. Blue looks lovely on a door, and yours is wonderful. Love it! My front door reads, “theres no place like home” and the back door says, “home is where the heart is”! I love having the numbers on the front door! What a nice touch 🙂 Thanks for sharing! Loving this! I have been wanting to put this on my door for a while. Thanks for linking up with us at Family Joy Blog Link Up party. Hope we see you next week.